"Astrid Fallon's Graphic Ephemeris for Forecasts (1920-2040) has been updated, revised and re-released. My 1998 edition is having its nodal return. It is so well loved, well worn and well used that I am looking forward to receiving the new edition (1960-2060). The layout of a year on a page makes it perfect for transit work. its attention to detail and focus on the cyclesand planetary pairs is outstanding. If you appreciate the profundity and syncronicity of planetary cycles, this ephemeris is made for you.I highly recommend this ephemeris as one that permanently sits on the corner of your desk." "This is one of the few books that remain on my desk all the time. Wonderful information for us tech freaks who want to be able to follow a planet year after year to get a pattern. It's an invaluable work tool.” So wrote the late Lois M. Rodden of an earlier edition of Astrid Fallon’s remarkable Graphic Ephemeris. I’m confident that she would have repeated this recommendation for Fallon’s latest bilingual (English/French) edition. Unlike any other ephemeris I know of, Fallon’s offers what astrologer Brian Clark describes as a “visual outlay” of annual planetary transits. These can be assessed at a glance of the pictorial horoscope for each year – with Aries to the right or on what we’d call the Descendant point in an ordinary chart, creating “the universal zodiac” as Fallon puts it. Zig-zag lines next to glyphs on the outer edge of the charts bring to life the movement of each outer planet, including Chiron – and ‘zig-zag’ because of retrogrades. Mercury, Venus and Mars are only shown by their retrograde positions at the centre of charts, with large black dots along the degrees to indicate successive lunations. The motions of the Mean Moon Node and Mean Black Moon are also shown. Other detail includes major and minor aspects, declinations (for Eris and Sedna, too), eclipses, the Moon cross and a separate graph showing planetary positions at the start of each month through the relevant year, and many other features. 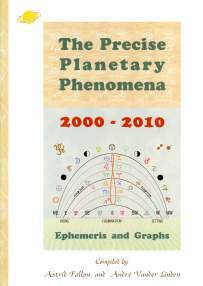 In addition to the graphic ephemeris there are supplementary chapters on the Occultation Series (when the Moon occults or moves in front of a slow-moving planet, strengthening the latter) from 1940 to 2060; planetary cycles; an equivalence table between ecliptic longitudes and declination; and much, much more for ‘data freak’ astrologers. In an age of computer astrology, some may wonder as to the point of such a book. After all, there’s plenty of astro software on the market. But in my view, for an instant planetary summary of each year or for a ready reference when researching the cosmic background or patterns to a past mundane or personal life event, I can’t think of a quicker way than to pick up this book. No more waiting for your pc as it slows down to download another fifty Windows updates! Hard copy books still have the advantage of speed of access to distilled information if you know what you’re looking for. Astrid Fallon is to be congratulated on producing such a book – which is well worth the price." "Clear, colorful, and crammed with useful stuff including circular longitudes, lunation charts, declination, and daily ephemeris." "Don't miss out on a fabulous resource! Data is analyzed & visualized in multiplicity: declination & longitude graphs & tables, aspect tables, astro*carot*graphy, eclipses, new moons, full moons, cazimi, occultations, tight conjunctions, heliocentric info, and so much more... it just gets better and better every year!" 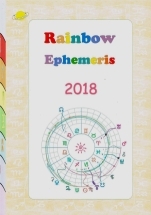 "Ask the Rainbow Ephemeris for Christmas and no one will get a word out of you for hours because you'll be so engrossed in this fascinating collection of astrological and astronomical data for 2005. [...] It can take a while to acclimatize yourself to this vast cache of information, but it's great fun working it all out. And a bonus for us in the UK, all the times are in GMT. [...] You won't care how much bad TV is on over the holidays because you simply won't have time to watch it." "This is a colorful and graphically rich tool for tracking cosmic patterns. There are longitude charts, circular graphs, and tables illustrating planetary motion. Also included are New and Full Moon charts, declination graphs, aspect tables, heliocentric graphs, geographic maps showing planetary eclipse paths, and maps showing parans at eclipses and other important phenomena." "This monthly ephemeris itself is lovely - in colour with month by month planetary positions, a graphic ephemeris and aspect grid, as well as declinations, ingress and the lunations - all are in GMT, which is great for immediate use since the mental calculations of GMT is pretty straightforward. Each page is full of information in graphics and text.[...] Highly recommended for novice to practicing astrologer." "Ephemerides, selected astromap phenomena, heliocentric data and much more. The diary includes ephemeris and major aspects only. These are among my favorites." "Things get better every year. In the Rainbow Ephemeris, Astrid Fallon ("22 years of astrology and still in love") achieves the near impossible feat of giving you just about everything you could require from an annual ephemeris without swamping you in detail. As the title Rainbow suggests, it is a colourful, easy on the eye experience, and comfortably spacious too. It's hard to believe that tables of longitude (shown in both normal and circular form), declination, heliocentric data, cartography maps, New and Full Moon charts, aspectarians, -and goodness knows what else- are contained in such a such a relatively small space and for each month of the year. Any eclipses are treated to a page apiece with maps, charts, times, parans -you name i - but still without appearing cluttered or bogged down in black type. The equal importance paid to declination means that other events in 2004 treated to page spreads include occultations and certain planets cazimi.This is more than an ephemeris, it's a learning experience. From our point of view we can see the value of an annual ephemeris designed by a 21st century working astrologer. It gives you what you want to know and all in one place. We trust the accuracy too. Everything is fully sourced and referenced and the author's collaborators include respected names in Denmark, Belgium and Germany." "Here is a product dear to the heart of every astrologer who uses declination. Astrid Fallon's useful annual Astro Graphic Calendars have evolved into the Rainbow Ephemeris - a colourful graphic tool to keep track of current cosmic patterns.The format of this annual ephemeris is large - the same size as this magazine - but with 48 pages and a stiff waterproof cover. A double-page spread for each month of the year is easily viewed as the pages lie flat when opened, and what a wealth of information they display. Circular graphs in longitude, standard longitude tables, ingress info. and charts of each month's New and Full Moon lead on to declination graphs, aspect grids and a comprehensive aspectarian. The declination graphs clearly show the 4 moon phases and when planets are out of bounds or when they cross the equator, and the utilisation of colour throughout avoids the confusion of losing track of which planet is which. But all this is just the beginning. Extra 2-page spreads are devoted to important astrological happenings during the year. For example Solar and Lunar eclipses are given a page each with precise declinations, longitudes and astrocartography maps. Occultations and planets cazimi are also treated to a page a piece with the same comprehensive coverage. The declination information by the way always includes Chiron, Ceres and the Black Moon. All data is in GMT. The front and back of the book give more graphs and charts as yearly over-views, including a heliocentric section. The genius though is in the layout and design. It is clear and uncluttered and is obviously the end product of much thought and previous experience. One detail particularly interesting to us is that the normal zodiac longitude charts are chosen to be shown with Libra rather than Aries rising. Astrid explains that this better matches declination and our visual understanding of the Sun at the northern solstice standing at the top of the chart as on the Cancer tropic, while at the southern solstice in December it stands below as on the tropic of Capricorn." "A currently available computer-generated astro-tool to help us work with the planets deserves a special mention. In her Rainbow Ephemeris, Astrid Fallon has worked with Jurgen Hoppmann, Laurids Pedersen and Andre Vander Linden to present a range of charts, graphs, lists and graphic ephemerides in a most usable way." "If you somehow neglected to get yourself an astrological calendar, you might want to check out Astrid Fallon's website. She has produced a full-colour graphic ephemeris that includes circular planetary motion for the month, ingress and declination tables, Astro*Cart*Graphy maps showing the culmination of cazimi planets and eclipse patths, and much, much more. All diagrams are clear and well laid out... Even if you have your calendar for this year, you micht want to check this out for 2004. It's useful, colorful, and well worth having." "This excellent visual ephemeris is beautifully presented in colour, displaying a variety of graphics. Included here are the authors unique circular diagrams of the planets movements: the longitude of the planets, Moons node and Chiron for each day; Moon phases and ingresses; declination; graphic ephemerides; cartography maps, and much more. The Rainbow Ephemeris integrates many of the features that were previously included in Astrids smaller booklets. The majority of the computer generated graphics have been generated by Astrid's customised version of Electric Ephemeris. The book is in colour and has 48 pages." Astrologers require access to planetary phenomena, but it is difficult to present lists of data in an engaging manner. The advantage of this series is that they are engagiong, and as with her previous publications, both clear and easy to read because of their sensible use of colour and well organised design. The are a pleasure to hold and aestetically pleasing to look at ; the sort of book you want on your bookshelf and would want an excuse to consult." "Detailed & carefully considered hard copy displays of the vital data are available." "Also available is Planetary Cycles at a Glance, a nifty little pocket book astrological tool that includes graphic depiction of planetary cycles, nodal cycles, lunation cycles, eclipses, and more. Excellent for serious student and more seasoned astrologers, this handbook packs a lot into a small package. This is the sort of publication that you end up wearing out from use, so consider protecting it in a protected sleeve." "The colourful charts, graphs and diagrams provide not only an extremely useful but also visually pleasing tool for the busy astrologer. Students in particular would find this a valuable handbook, for the visual impact of the presentation dramatically enhances the importance of the structured nature of planetary cycles for the teaching and understanding of astrology. First, tha astronomical data of the Sun, Moon, the Nodes and individual planetary cycles are presented clealy together with a coloured chart for each ; and the 10 inter-planetary cycles of the planets from Jupiter to Pluto are displayed, each one as viewed from its respective conjunctions. this notebook also contains other usefull information, not least the longitude graphs and the declination graphs for the outer planets for the period 1840-2080." "Get Cycling - A handy, quick reference for astrologers and others who want to keep abreast of planetary movements without reference to an ephemeris is Planetary Cycles at a glance by Astrid Fallon who has made a speciality of conveying astrological data in graphic form. This latest publication is an A5 44-page booklet, printed in colour, showing all the planetary cycles (from the Moon out to Pluto including Ceres and Chiron) graphically and with explanatory text. 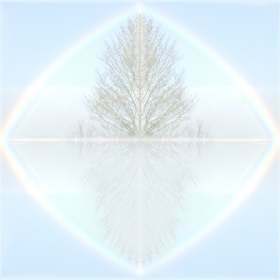 Thus it is easy to see and understand the planetary patterns that have such a strong influence on our lives, both as individuals and as members of the larger global community. Additional astro data includes great conjunctions 1960-2040, life cycles and world clocks. This is a highly accessible and very useful little book, well worth its cover price of £6.50." "This excellent booklet features colourful and easy to understand diagrams which illustrate a wealth of astrological information. One can, at a glance, see where and when various planetary alignments have occurred over the years. Also included are planetary, eclipse, nodal and life cycles. A useful reference work for all astrologers." "For thoroughbred astrologers: Planetary Cycles at a Glance, is the tilte of a new publication of Astrid Fallon with graphics of planetary cycles, declination graphics, Moon-distance graphics and so on and so forth!" "The format of the ephemeris is innovative and creative, unlike the format we are used to seeing in the traditional ephemeris. Eachyear is assigned two pags: the first page is a graphic overview of the year demonstrating the zodiacal travel of the superior planets throughout the year, their direct burst and their retrograde motion. The inferior planets mercury and Venus are shown in their retrograde phase. needless to say, this quick overview of the transits for the year and the zodiacal ground they will cover. I was thrilled to see this as each year I map this planetary travel and the planetary stations and encourage students to do the same when working with transits... As visual outlay of the year, this is a great reference. The second page is the more standard ephemeris, although presented differently. The value of this ephemeris is the visual feel of the planetary movements. "This is a visual ephemeris that devotes a two-page spread to each year from 1920 to 2040; the left page shows the zodiac wheel and planetary motions, and its facing page is a table with planetary positions… There are lots of Appendices with all manner of useful information… The book is very cleanly designed with artistically presented charts. …This will be a well-used book in my library and I recommend it as a reference to all who do mundane work or forecasting for clients." Mary Plumb, The Mountain Astrologer n°82 - Dec. 98 (Usa). "This graphic ephemeris is a boon to those who want a year at-a-glance method of plotting planetary movements (including Chiron) - it so quick and easy to see retrograde periods when these are depicted graphically - especially mundane and predictive astrologers. Each spread shows Lunations and eclipses, major and minor aspects plus a list of key degrees' that will be emphasised during a particular year." Jo Logan - Prediction, Dec.98 (Uk). 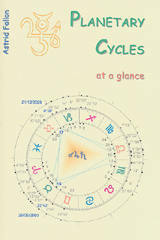 "This is a great graphic ephemeris, made to order for anybody who likes to predict or does a lot of mundane astrology. Very useful... Fallon provides an easy overview of the yearly planetary movements seen in one fell swoop. ... Aside from the aforementioned ease of finding transits and other yearly phenomena, there are some additional 'goodies' in the appendix such as Planetary cycles, Life cycles,... and much more. " Marion March - Aspects (Usa) and The Astrological Journal Vol. 40 n° 3 - 1998 (Uk). 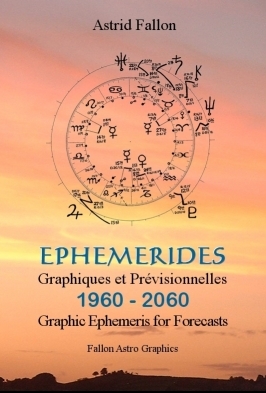 "Astrid Fallon's ephemeris is a useful quick reference for the years 1920-2040." "…This is one of the few books that remain on my desk all the time. … Wonderful information for us tech freaks who wants to be able to follow a planet year after year to get a pattern. Say for example, we can flip through the book and watch Pluto move from Cancer to Aquarius. … It's an invaluable work tool." Lois M. Rodden - Data News n° 72 (Usa). "... Anyone working extensively with transits might find this repays investigation : a large amount of information is rendered clearly... This has the air of a book which, for those who do have use for it, would quickly become indispensable. " John Frawley - The Astrologer's Apprentice n° 8 (Uk). "Astrologer Astrid Fallon's work is a wonderful combination of practical astrology (she exhibits a broad understanding of cycles and planetary movement) and a lovely, whimsical sense of design. Although her Web site is primarily a place to order the various astrological tools that she makes, sample graphs and tables are reproduced here, to provide a visual glance at various astrological phenomena - for example, Mercury's three retrograde periods each year (from 2000 to 2016), Mars retrograde cycles (from 1988 to 2020), and the Jupiter-Saturn conjunctions (from 1702 to 2159). Fallon writes a short newsletter, posts a monthly calendar in her unique graphic format, and offers articles on the importance of occultation and cazimi. She has a very interesting article demonstrating the importance of parans in the world map for an eclipse. She also explains her thorough grounding in astrology's third dimension, declination. Not all of the designs reproduce clearly in this digital format; however, if you are a visual learner, you will enjoy Fallon's approach." Mary Plumb, The Mountain Astrologer n°108 - April/May 2003 (Usa). "Fallon Astro Graphics is for the fairly experienced astrologer. This site shows a range of useful data, diaries, and ephemerides (tables of planetary positions) and calendars available by mail order at resonable prices. There are informative and well written articles and news items on the world of astrology. The site is beautifully presented and easy to navigate." Peter Watson, The Daily Mail - Weekend, 22nd March 2003 (Uk). "The enigmatic Astrid Fallon stood before us this evening and gave us a lesson in Declination - the third dimension of Astrology. She made the trip from Sheffield to talk to us about Astrology in 3D. She is, of course, talking about declination - the factor which we can't represent on flat paper. After taking us through an introduction and overview of the references she used (this information is on her website), she began by explaining the most obvious point: if a planet has high declination (in the northern hemisphere) then it will spend more time above the horizon in the day. Indeed this is also true of the signs of the zodiac which have higher declination. Declination, she explained is simply the distance a body can be away from the celestial equator. Now planets don't travel along the celestial equator but along the ecliptic and we know that these two great circles cross at 0 degrees Aries, therefore, anything in Aries must have a declination approaching zero and the same must go for Libra. Following the same logic, the solstice signs (Cancer and Capricorn) must have high declination. Astrid then took us through the cycle of the year, starting in mid winter with maximum southern declination and matched the season's to the increasing altitude of the sun in the sky: higher declination more hours in sky during day. She then showed us a slide of the Anelema, which is a time lapse photograph of the position of the sun through the year. It traces a figure of eight which is very like the symbol for infinity. We looked at out of bounds planets - that is planets with declination higher than 22 degrees. These have a purer, wild, untamed character about then as if they were able to avoid playing by the agreed rules. The nodal cycle ties in to whether we have an out of bounds Moon. When the node is at 0 Capricorn or Cancer things are "normal", the Sun and the Moon have equal declination, when the node approaches 0 Libra the Sun is higher than the Moon and rationality rules, but when it gets towards 0 Aries the Moon is OOB (out-of-bound), higher than the Sun - this is where we are presently folks - and our emotional nature has the upper hand. After valiantly packing in so much material and stunningly beautiful graphics we finished with a quick look at declination cycles across the last century. No surprise to see a peak in the early 1940's but we also saw that the recent Jupiter Saturn conjunction - being in Taurus - also was at a peak. We hope to see Astrid again soon as we just know we haven't even scratched the surface. Her many years of research into this subject showed in the wonderful graphics and charts she showed during the evening. Check out her website and see all the wonderful tools on offer for yourself. Thank you Astrid."